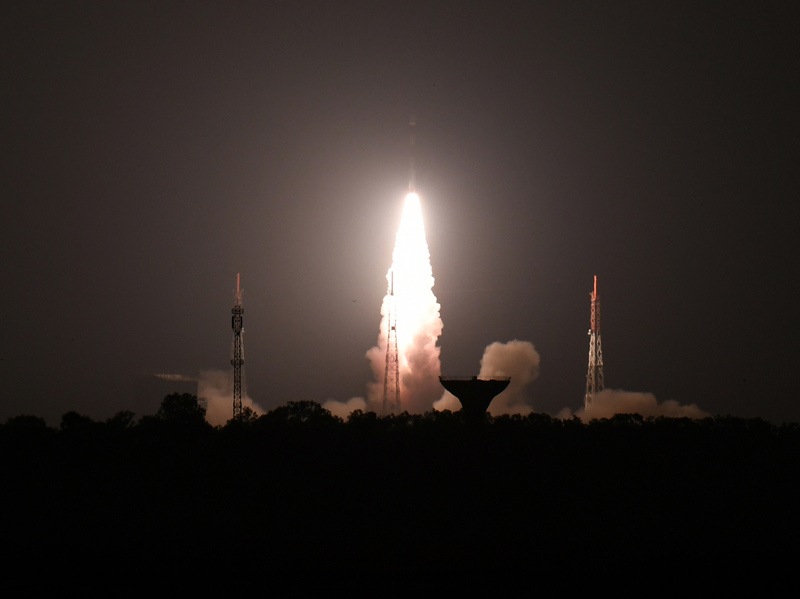 India Claims Successful Test Of Anti-Satellite Weapon New Delhi says it destroyed one of its own satellites in orbit, making India only the fourth country to test such a weapon. Experts believe the target of Wednesday's anti-satellite test was India's Microsat-R, which is shown here launching in January. A statement from the ministry of foreign affairs said the test was conducted by India's Defence Research and Development Organization. In it, a low-orbiting Indian satellite was struck by a ballistic missile interceptor fired from a test site on an island in the Bay of Bengal. India has been looking at conducting an anti-satellite test since 2007, when China destroyed an orbiting satellite, according to Brian Weeden, the director of program planning for the Secure World Foundation, a nonprofit that tracks space weapons. "From an Indian perspective, they are in a competition with China for regional power, influence and prestige," he says. China has continued its anti-satellite program since 2007, and India has been worried about getting left behind, Weeden says. The test may have also furthered India's ballistic missile defense program, says Vipin Narang, an associate professor of political science at the Massachusetts Institute of Technology. Testing a missile capable of hitting a satellite is "a hop, skip and a jump away from a ballistic missile defense test," Narang says. "In some ways it's easier because the satellite is in a very stable trajectory." India's interest in missile defense is part of an arms race with another regional rival: Pakistan. Narang says there are signs that India may be shifting its nuclear strategy to one of "counter-force targeting," which would involve striking as many Pakistani nuclear weapons as possible on the ground before the onset of a full-scale conflict. "You need to go hunt Pakistani strategic nuclear systems, but you also need ballistic missile defenses to relieve the pressure of having to get all of this system," Narang says. In other words, if a Pakistani nuclear missile was launched, an Indian defense system might be able to catch it before it lands. Narang notes that the timing of the test is not a coincidence. With a national election just weeks away, Modi is making a strong push to make his ruling Bharatiya Janata Party appear tough on security issues. Narang says his televised announcement stands in sharp contrast with the 2008 Chinese test, which took place under a veil of secrecy. The Indian test "was really very clearly about domestic politics," Narang says. Experts say the most likely target of Wednesday's test was a satellite launched in January known as Microsat-R. The satellite orbits at between 260 and 282 kilometers above Earth, making it a relatively low-altitude target. That should mean much of the debris from the test will fall back to Earth relatively quickly, Weeden says. "The big question though is whether the intercept created dynamics that threw pieces into higher orbits," Weeden says. In 2008, a U.S. test struck a satellite at an altitude of roughly 135 miles. Most of the debris fell back to Earth, but a dozen or so pieces were thrown higher up and stayed in orbit for around a year and a half, Weeden says. Ultimately, these weapons are extremely dangerous because of the extensive amount of debris they can create. The 2007 Chinese test struck a satellite at higher altitude and created thousands of pieces of debris, many of which are still circling the Earth. Weeden says the actual use of these weapons would look more like that test. "If you're using in a wartime setting, it's very likely your targets are going to be at higher altitudes," he says. Clouds of debris from the conflict could make low-Earth orbit a dangerous place. "It would create a lot of space debris, which would have long-term challenges for everyone," he says.